I started teaching at ISEL back in 2001. Since then, I lecture fundamental topics like Programming and Computer Graphics, but also Internet Programming, Information Systems and Datamining. I was a member of training teams that deliver courses to industry partners (e.g. Siemens) and to university staff, mainly about the .NET framework. I get my PhD at FCT-UNL in Computer Science. 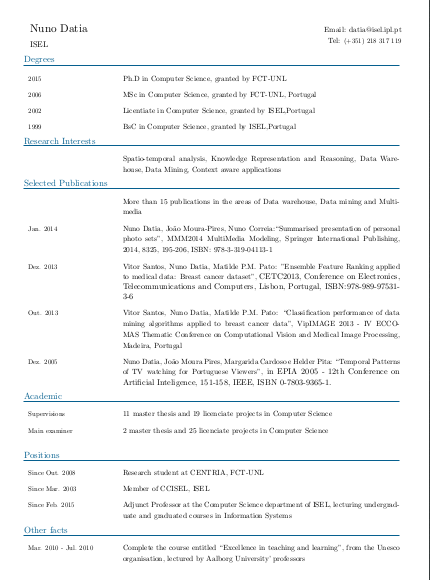 Currently, I am an associate member at NOVA Lincs research center, a member of the Spatio Temporal Analytics Research interest group, an adjunct professor at ISEL and coordinator of the Master in Informatics and Computers Engineering at ISEL.